When one looks over the various traction engine catalogs and reads the descriptions of each of the valve and reversing gears described therein, he is apt to think, unless he is especially observing, that each designer has succeeded in finding something entirely different from any of his competitors. Such, however, is not the case, as we will attempt to show. As a matter of fact, there are only three different principles involved in all traction engine reverse gears, consequently we may divide all gears into the three following classes. 1. The Link Reverse, using two eccentrics. 2. The Radial Reverse, using one eccentric. 3. The Shifting Eccentric reverse gear, with one eccentric. There are many modifications of each of these three classes, but, as before stated, all traction engine reverse gears fall into one or another of these classes. They will now be taken up and discussed in the order just given. 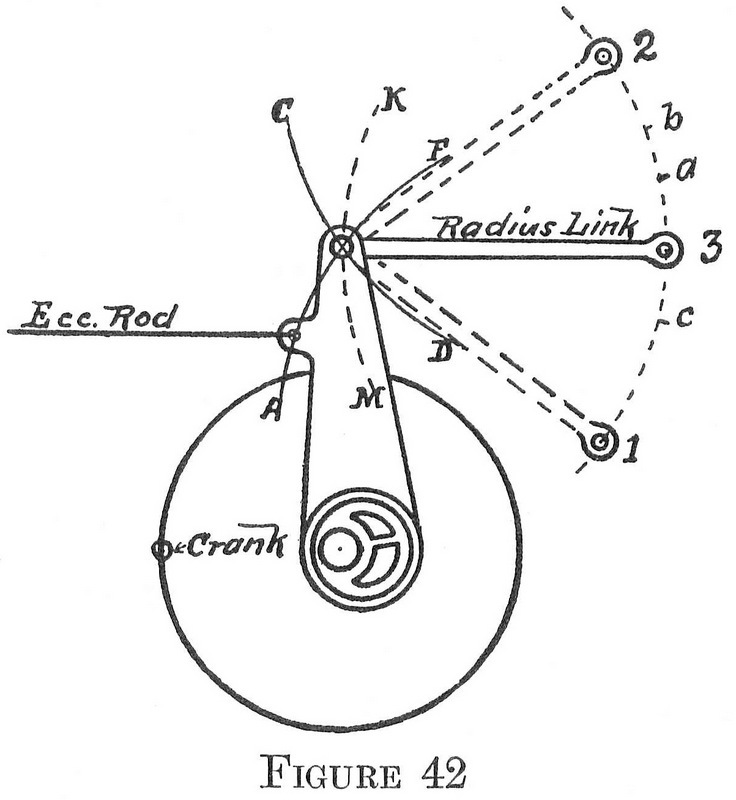 The Link Reverse is provided with two eccentrics, one set about 120 degrees ahead of the crank, the other just as far behind, as shown in Fig. 39. If these two eccentrics are so arranged that either one can be made to drive the valve it is evident the engine can be reversed. 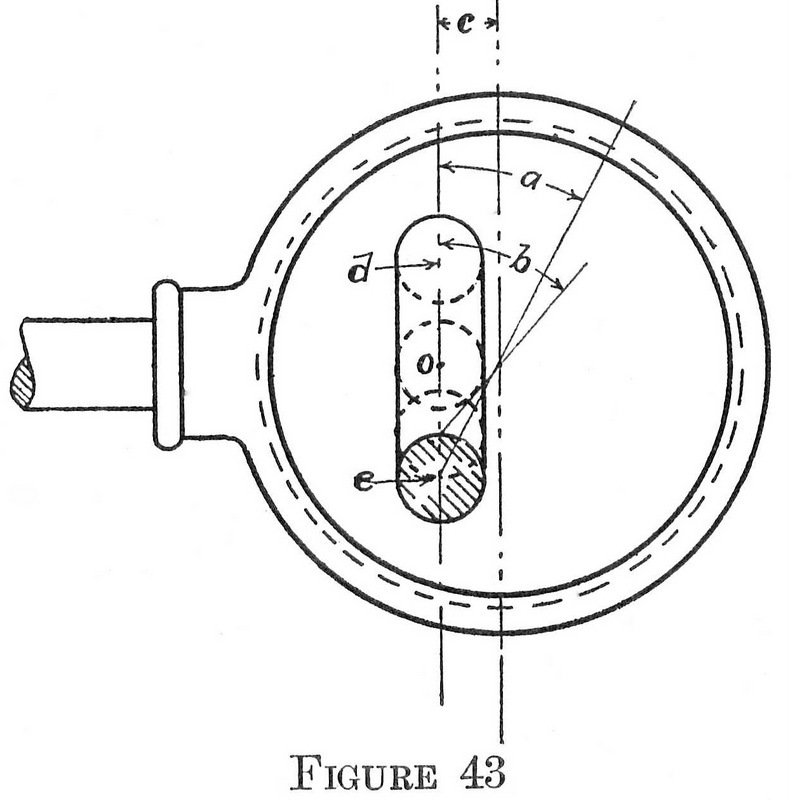 With the crank in the position shown, the piston must be at the left end of the cylinder, and for the engine to run the left steam port must open. If the eccentric rod were fastened to the upper eccentric E, the crank must move upward to pull the valve toward the right. On the other hand, if the eccentric rod were fastened to E, the crank must move downward to pull the valve toward the right. We could reverse an engine with two eccentrics set in this way by detaching the eccentric rod from one and fastening it to the other eccentric, but the device would be very awkward and it would be necessary to stop the engine each time we wanted to reverse it. To get around this difficulty. a curved link is used provided with block B, Figure 40, which is free to slide in the link, The two eccentrics are attached to the link as shown, and the valve stem is fastened to the block B. The link is suspended from its center by means of a strap S, attached to the bell crank lever L. The latter is pivoted at P to some point on the engine frame. 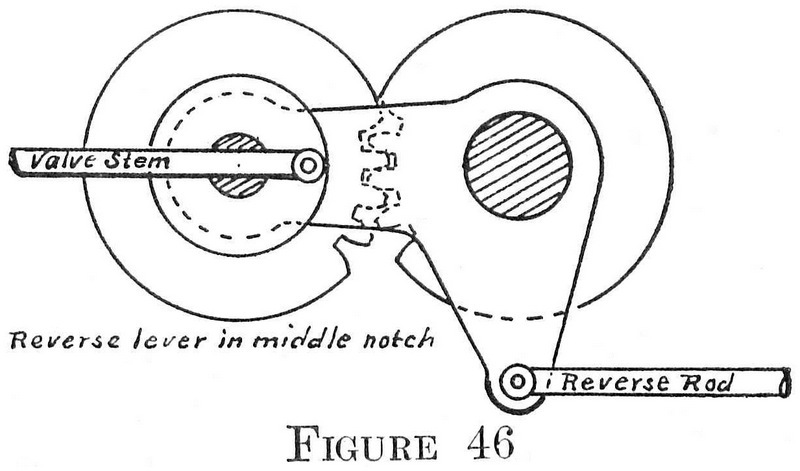 Connection between the bell crank lever and the reverse lever R is made through the rod D. When the reverse lever is in the center notch of the quadrant, as shown in the drawing, the block B is in the center of the link. If the reverse lever is pushed forward to notch e the link will be raised and the block B will be in the lower part of the link opposite eccentric E’. In this position the other eccentric will have practically no effect upon the movement of the valve at all and so the throw of the valve, and the direction of rotation of the engine will depend entirely upon eccentric E’. If the reverse lever be made to occupy position f, the link will be pushed down and eccentric E will control the valve and the engine will be reversed. If the reverse lever is in the middle notch, the link will merely rock back and forth under the action of the two eccentrics and since the block is in the middle of the link it will have almost no movement and the valve will remain practically stationary. However, if the reverse lever be shifted to d so that the block occupies position G, the valve will be under the influence of both eccentrics, but since it is nearer to E' than to E, the former will give the engine its direction. The effect on the valve will be to shorten its travel, provide less port opening and cause cut-off to occur earlier in the stroke. By providing the reverse quadrant with the proper notches, cut-off can be made to occur at any place in the stroke from almost nothing up to the maximum for which the reverse gear is designed. It will thus be seen that the link reverse not only provides a means for reversing the motion of the engine, but also controls, to a large extent, the distribution of steam to the cylinder. Stephenson, the inventor of the locomotive, invented the style of link reverse used on traction engines. It is said that all he aimed to do was to design something that would merely reverse the engine, but after the link was put in operation it was discovered that it could be hooked up and thus control the cut-off of the steam as well. This makes it very valuable on locomotives, because the engineer can save steam by hooking up whenever he comes to an easy grade. It also enables him to govern the speed of the engine by cutting off the steam a little early and thus reduce the average pressure on the piston. The angularity of the connecting rod affects the valve motion in just about the same way as for a simple engine. The Radial Reverse Gear — In this type of gear the eccentric sheave is fitted with a long strap to which the eccentric or valve rod is attached. The outer end of this strap is compelled to travel in a fixed path either by means of a guide or by means of a radius link. There are several styles of radial gears applied to traction engines, but the one which is most familiar is the Woolf reverse. A diagram showing the principles of this gear appears in Figure 41. The eccentric is set just opposite to the crank, and the valve rod is attached to the strap S, at E. The upper end of the strap is provided with a guide block or roller which moves along an inclined guide. This guide may be tilted, either in the direction of AF or CD. When in the position AF the engine must run in the direction of the arrow. When the guide is tilted in the direction CD the engine is reversed. When the engine is on dead center the valve shows a certain amount of lead. The center of the guide block B is opposite the pivot on which the guide turns, so that moving the reverse lever does not move the valve. Referring to the figure it will be seen that if the crank is rotated in the direction of the arrow the block B will move upward along the guide AF, and toward the right, thus pulling the valve toward the right and opening the left port. If the crank were moved up and the guide left the same, the valve would close the port and the engine could not run. Practically the same direction could be given to the strap S, if it were connected up with a radius link as shown in Figure 42, instead of with a block and guide. If the link be pivoted at 1, the end of the strap must move along the line AF, and if pivoted at 2, along the line CD. These two arcs, it will be noted, correspond to the directions of the guide in Figure 32. When pivoted at 3 the arc KM will correspond in general direction to the vertical position KM of the guide in Figure 41. This is the direction the end of the strap will take when the reverse lever is in the center notch in either case. When the point B moves along the line KM the valve will have practically no movement. If an engine with a gear of this kind has the reverse lever placed in the center notch it may keep on running, if it is not loaded. It will not get steam enough to do any work, however, if the valve is set right. If the guide in Figure 41 is tilted a slight amount from the position KM, the valve will be given only a little movement and cut-off will occur early. Or, if the point P in Figure 42 be made to occupy positions a, b or c the valve will have a smaller movement than when it is at 1 or 2 and cut-off will occur earlier. It is clear, therefore, that with a radial valve gear an engine may be hooked up as much as may be desired. Some of these gears are arranged to give an equal cut-off on either the forward or backward stroke. All of them do better in this respect than the link reverse. They all provide for an equal lead on both strokes. The lead, furthermore, is constant, that is, it is the same for all cut-offs, while the lead of the link reverse either increases or decreases as the engine is hooked up, depending upon the way the eccentrics are set. The radial gear is very susceptible to lost motion. If not adjusted correctly and lost motion exists, the radial reverse does not give very good distribution of the steam to the cylinder. In this respect it does not give quite as good results as the link. However, they are both good reverses, and since both the good and the bad points of both have been presented, the reader may judge for himself between them. Shifting Eccentric Reverse Gears — The eccentric in this type of gear is usually made in the form of a ring through which the main shaft passes. This ring is provided with planed guides on one side which are free to slide in ways attached to a hub which is secured to the shaft by means of a set screw. Motion is given to the eccentric by various means, such as with a rack and pinion, toggle levers or two racks having teeth cut at an angle of 45 degrees. 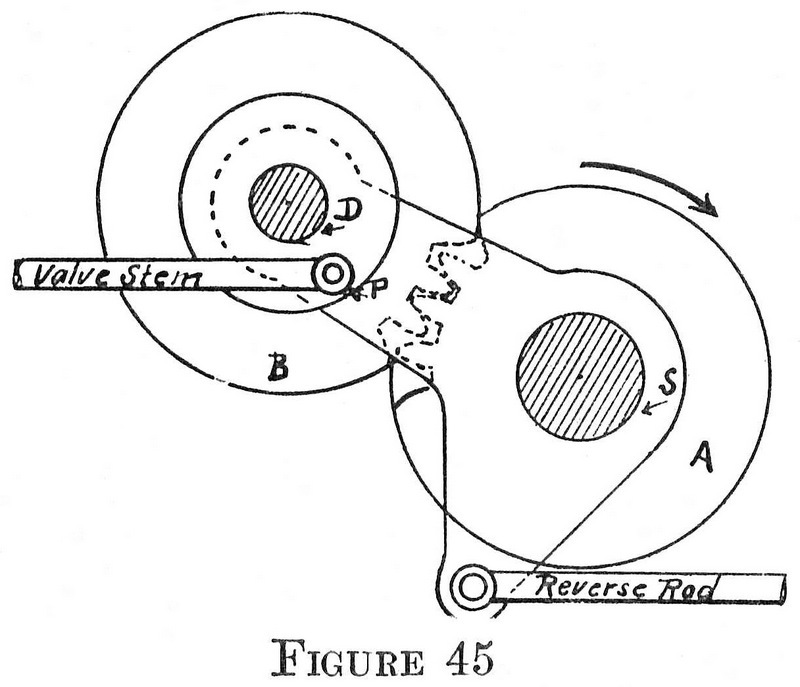 Reverse gears of this type are made in two styles, illustrated diagrammatically in Figures 43 and 44. 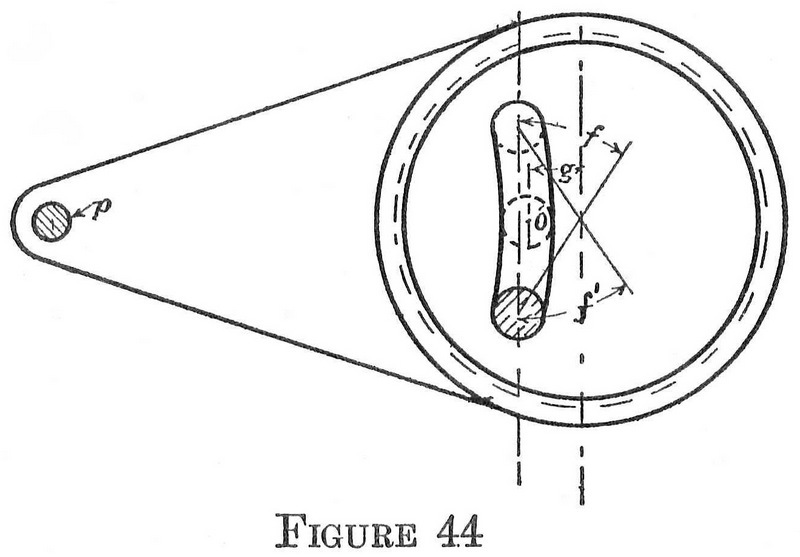 In Figure 43 the eccentric is made to slide straight across the shaft, thus changing its position with relation to the shaft. In Figure 44 the eccentric rotates slightly about the shaft on a center at p, and in this way its position relatively to the shaft is changed. In Figure 43 it will be observed that the center of the eccentric is set to one side of the center of the main shaft, a distance represented by c in the diagram. This distance is made equal to the lap plus the lead of the valve. The crank is supposed to be at the left of the figure and the engine on dead center. When the eccentric is lifted to its extreme upper position, the shaft is at e and the crank will move in the same direction as the hands of a watch. If the eccentric is dropped clear down until the shaft is at d, the eccentric will be in position to reverse the engine. When the shaft is either at d or e, or, to be more exact, when the eccentric is shifted up or down to its extreme position, the valve will have its greatest movement and steam will be cut off at the latest point in the stroke. In full gear, either forward or back, the travel of the valve from mid position is equal to the distance from the center of the shaft to the center of the eccentric. When the shaft is at e, the angle of advance of the eccentric is a, but when the eccentric is dropped down so that the shaft occupies the position of the first dotted circle above e the angle of advance has increased to b. As the reverse gear is hooked up, therefore, it is clear that the angle of advance increases. Also the distance from the center of the shaft to the center of the eccentric decreases, and consequently the travel of the valve becomes less. The effect of increasing the angle of advance is to make cut-off occur earlier, consequently when this valve gear is hooked up the travel of the valve is shortened and cut-off is made to occur earlier. When the reverse lever is placed in the center notch, the eccentric is dropped down until the shaft is at o; here the throw of the eccentric is just equal to the lap plus the lead equal to c in the figure. If an engine with this sort of a reversing gear is running light it will keep on running when the reverse lever is in the center notch because the valve is allowed to open the ports the amount of the lead and admit some steam. Cut-off can not be made to occur at the same point in both forward and back strokes because of the angularity of the connecting rod. The lead, however, is practically the same for all positions of the reverse lever, no matter which way the engine is running, because the eccentric is shifted across the shaft in a straight line. In Figure 44 the eccentric is pivoted at p to a disc which revolves with the shaft, and the path taken by the center of the eccentric when shifted either to one extreme position or the other is the arc of a circle having p as a center. 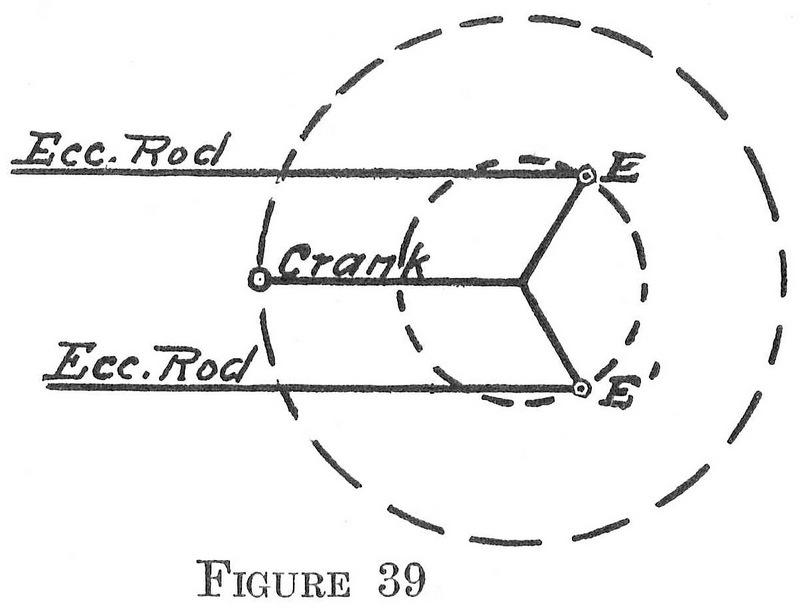 The position of the crank in this diagram is toward the left and the engine is supposed to be on dead center. When the eccentric is in the extreme upper position as shown in the figure the angle of advance is f and the engine is in full gear forward. As the eccentric is dropped down nearer to mid position the angle of advance becomes greater just as in the other reverse gear previously described and cut-off occurs earlier. On account of the curved path taken by the center of the eccentric it follows that as the center of the eccentric approaches nearer the center of the shaft, as it does when the engine is hooked up, the lead decreases, and when the reverse lever is dropped down the lead increases. The valve may have the same lead on either the forward or backward motion, but it can not have the same lead at all points of cut-off. The Gear Reverse is illustrated in Figures 45, 46 and 47. Referring to the figures, S is the main shaft, A is the spur gear attached thereto and B another spur gear of exactly the same size meshing with A. A gear box G is pivoted on the main shaft and carries the gear B and the crank disc C. The valve stem is attached to this disc by means of pin P. When the main shaft revolves the gear A causes both the gear B and the crank disc C to revolve. In this way motion is given to the valve by means of a crank instead of an eccentric. Since an eccentric is only an enclosed crank it follows that the motion imparted by the crank will be no different from that given by an eccentric having the same throw. 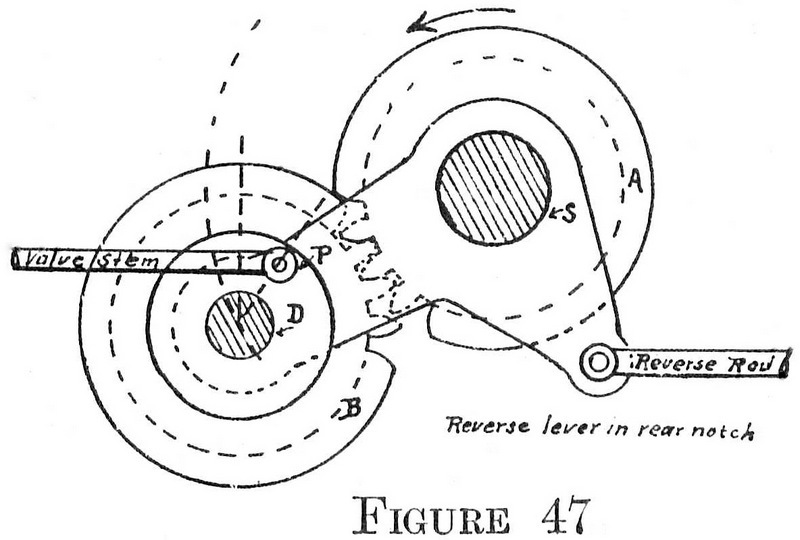 Figure 45 shows the position of this gear when running in the belt, Figure 46, when the reverse lever is in the middle notch, and Figure 47 when the engine is reversed. At first sight it does not seem as though this type of reverse gear belonged to any of the classes just described, but a little consideration will show that the effect of this arrangement is identical with that we would have with an eccentric that is arranged to rotate around the shaft. Considered in this way, it clearly comes under the head of shifting eccentric gears. As shown in the diagrams, there are only three positions for the eccentric, namely, full gear forward, full gear backward and mid gear. In other words, a reverse gear of this type cannot be hooked up, but must take steam during whatever part of the stroke it is designed for.